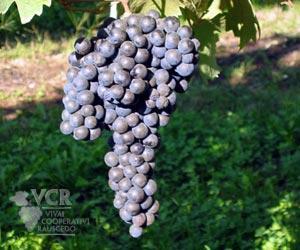 is a dark-skinned grape known for producing inky, tannic wines, particularly. Primitivo di Manduria and its naturally sweet Dolce Naturale variant. A classic Primitivo wine is high in both alcohol and tannins, intensely flavored and deeply colored. In Manduria, the fortified liquoroso variants often reach an ABV of 18%, which is dulled to 14% in the table wines. A certain bitterness is often found in Primitivo which, combined with its mouth-puckering tannins, means that it needs a few years in either bottle or barrel. Although there have been contentious and long-running debates about the variety's geographical origins, there is little question that Primitivo's modern-day home is in southern Italy, particularly Puglia. It probably arrived there from the coastal vineyards ofCroatia (just across the Adriatic Sea), where it is still grown today, under various tongue-twisting names including Tribidrag and Crljenak Kasteljanski. In the early 19th Century, the variety was introduced to the United States, under the name Zinfandel. It proved extremely successful there, earning a reputation as the American 'national grape'. It caused significant consternation on both sides of the Atlantic when DNA analysis proved that Zinfandel and Primitivo were the same variety. For the full story, and listings of Zinfandel wines, see Zinfandel. Primitivo has endured something of a rollercoaster ride in the past few decades. In the 1990s, the variety was at its lowest ebb for a long time. The EU's vine pull schemes had seen thousands of acres of Primitivo vines ripped out of the ground. Being relatively difficult to manage in the vineyard, Primitivo suffered worse than many other varieties. But across the Atlantic Zinfandel was booming, which doubtless contributed to Primitivo's new lease of life. The new-look Primitivo that soon began to emerge was no longer just a blending variety, it was now the historic grape behind southern Italy's flagship wines. The name Primitivo translates roughly as "early one" (there is an obvious link here with Tempranillo, which means the same thing in Spanish), and refers to the variety's early-ripening nature. One might be forgiven for thinking that the grape was in some way "primitive", perhaps less refined than other grape varieties. The robust character of much Primitivo wine does little to correct this mistake – even in Puglia it is known as Mirr Test ('hard wine'). Synonyms include: Zinfandel, Crljenak Kastelanski, Pribidrag, Tribidrag, Kratosija.